From the onOne site: "DSLR Camera Remote is the next-generation cable release for your Canon EOS DSLR camera. Just connect your camera to a WiFi enabled computer and the DSLR Camera Remote software enables you to use your Apple iPhone or iPod touch to wirelessly adjust cameras settings, fire the shutter, review images, even get a live viewfinder preview. 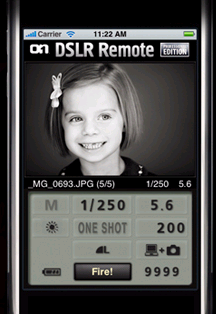 DSLR Camera Remote is a must-have for remote shooting applications like high or low angles, self portraits and children. With its advanced timers it makes remote monitoring a snap. No internet connection required!" The app even lets you review the shot you just took, to confirm you got what you wanted. Two versions are available - lite for $1.99 and professional for $19.99. Both are available through the iTunes Store.